Polish Poster art was a prominent movement from 1945 through the fall of Communism in 1989. During this period the Polish Government financially supported this movement in art and even encouraged it because posters were a popular form of propaganda. The popularity of Polish Poster art spread beyond Polish borders and many of the Poster designs and their artists became internationally known (Contemporary Posters). At the end of World War II, Poland was rebuilding and all over the country building sites were being covered in posters. For this new form of street art, temporary wooden walls were the substitute for museums and galleries. Poster art in Poland combined painterly experience with the impact of poster advertising, creating a unique form of art that removed the “distinction between designer and artist” (Contemporary Posters). Each artist had their own aesthetic, but the Polish Poster School was known for its “painterly gesture, a linear quality, and vibrant colors, as well as a sense of individual personality, humor, and fantasy” (Contemporary Posters). The Polish Poster School emerged during the 1950’s and was a distinct deviation from the popular style of realism that was pervasive throughout European art. The posters designed and produced by the school were extremely diverse because the artists adopted different forms of expression. Henryk Tomaszewski, the artist attributed with founding the school, was known for his use of symbols and abstraction. Franciszek Starowieyski liked to shock his viewers, thus his style was mostly painterly and surrealistic.Walemdar Swierzy was known for his use of bold color schemes and spots of colors. Jan Mlodozeneic made the conscious choice to use simple lines and spots in the style of Primitivism. What united the artists of the school were their ambition and the fact that the posters of the Polish school made the viewer think. The public was expected to understand the signs, symbols, and allegories hidden within these posters (Sarzynski). 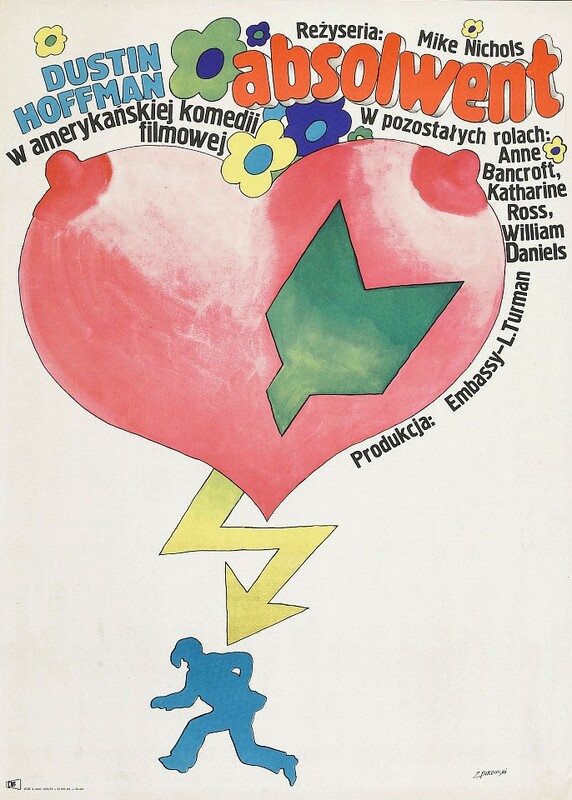 “Polish posters were not only pieces of art, but also intellectual labyrinths and games of hide-and-seek. Posters referred not only to emotions, but to intellect as well” (Sarzynski). At the advent of the poster movement in 1945, Poland had recently been created and was incorporated into the Soviet Union as the Polish People’s Republic. As a result of the political alliance, all media, including poster art and other forms of artistic expression, was subject to censorship. During the 1950’s and 1960’s the state took on the role of both patron and censor and began funding many of posters throughout the country. The success of the school was dependent not just on support from the state, but also from businesses and cultural institutions. These organizations and businesses paid to have posters for their upcoming play or concert designed by an artist from the Polish Poster School (Contemporary Posters). Waldemar Swierzy remembers “[t]here were years when I was making a poster every week, and every so often I had to decline commissions” (Sarzynski). 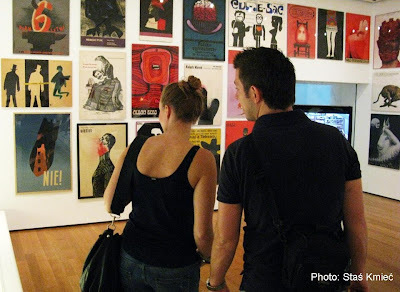 The first ever International Poster Biennale took place in Warsaw in 1966 and the world’s first poster museum opened just two years later in Wilanow (Contemporary Posters). During the 1970’s the amount of state supervision of media steadily decreased, allowing poster artists increased freedom to insert their own opinions and ideas into their designs. With this new wave of artistic freedom came bolder and more dynamic designs which were extremely popular. However, the fall of Communism in 1989 and the transition to a free market economy led to a drop in the popularity of Polish poster art. Businesses could no longer afford to commission such posters and the state funding disappeared (Contemporary Posters). The Polish School of Posters was famous worldwide over a period of forty years. From the beginning the posters produced within Poland were viewed on an international level through international art competitions. The completion and subsequent awards helped establish the international importance of the golden era of the Polish Poster School. The Museum of Modern Art presented the exhibition: Polish Posters 1945-89, an installation drawn from the Museum's collection of 24 posters from the Cold War era of the Polish Poster School, which attracted international attention and admiration. Today contemporary and vintage art posters are collected and sold as art and are exhibited in galleries, museums, and in private collections. In the United States the Museum of Modern Art, Autry Museum of Western Heritage, Polish Museum of America, the Library of Congress, and the Ringling Museum of the Circus all have posters from the Polish School on display or in their collections (Contemporary Posters).